On August 5th, it seemed like only two people believed in the 2011 Giants. Five months and a Super Bowl berth later, I think it’s safe to say we were right. Hanlon is right on. He’s never been afraid to take anyone on whether it’s a fool like Rex Ryan or even his own disillusioned fans. Nobody is forcing anyone to root for the Giants. If you’re so unhappy about the team’s moves then go root for the Jets or the Eagles. 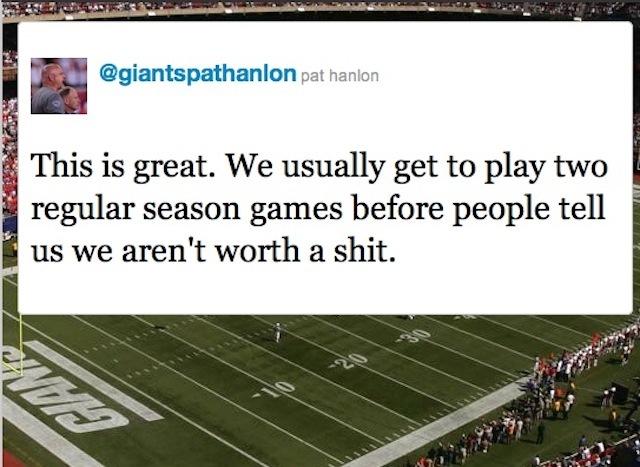 For some reason, the criticism against the Giants always seems to come doubly harsh. They won 10 games last year and missed the playoffs on a tiebreaker. That’s a good season. Not great, but a very solid season in which there were a ton of injuries. They won 10 games in 2007 and then all they did was win the Super Bowl. Management didn’t have a ton of money to spend and they weren’t willing to take big financial risks on question marks. Some guys, like Mathias Kiwanuka, took less money to stay with the Blue. Others, like Steve Smith and Kevin Boss, went for the cash and there’s nothing wrong with that. They’re both Champions who played significant roles in the greatest Giants season of all-time and they’re allowed to think for themselves and their families. I’ll personally always think of them fondly and wish them well (even Smith playing for a division rival). The fact of the matter is that everything isn’t as bad as everyone is making it out to be, just like Hanlon said. Every significant skill player is back. Coming out of the lockout, that’s going to be important as teams have less time to assimilate newbies into their systems. Ahmad Bradshaw and Brandon Jacobs were running really well towards the end of last year when they were both healthy and should play a larger role in the offense. Hakeem Nicks and Mario Manningham were also money in 2010, combining for 20 TD’s and nearly 2,000 yards. With another year of Eli’s passes coming their way, their numbers should only continue to improve. When Osi Umenyiora’s situation is resolved, and it looks like it might be soon, every healthy, young player from last year’s team will be back and ready to contribute. The losses hurt but there are a lot of young players waiting in the wings that will need to step up. General Manager Jerry Reese has proven to be a good evaluator of talent before and hopefully guys like Kevin Boothe and Travis Beckum will pan out. He may have dug himself a hole by mismanaging the cap a bit but he is also prudent in leaving some room to make adjustments as the season gets closer and even during the season. Reese is a tough guy and knows what he’s doing. He also does a great Jim Fassel impression. Champions know that the game is played on the field. All the Giants fans that are complaining need to take their whine somewhere else. A season isn’t lost with one injury or defection. The Dream Team can start planning their parade down Broad St. as Michael Vick rides in a float with a litter of puppies and Steve Smith brings up the rear in a motorized wheelchair. I won’t start thinking about it until February 5th. Talk is cheap. Play the game. Keep calling out the haters, Pat Hanlon. You are a man’s man.